Anushka Sharma has produced Phillauri, and even if the idea is picked from Corpse Bride, she can be given credit for backing an unusual film and offering a break to a new director Anshai Lal. The film begins with ‘Kaneda’-returned Kanan (Suraj Sharma) being bludgeoned into marriage to his childhood sweetheart Anu (Mehreen Pirzada). Kanan is ‘manglik’ and to ward off future misfortune, he is forced to marry a tree, which is then cut down. The tree housed a resident ghost, Shashi (Anushka Sharma), who now claims to be married to Kanan, whose fixed sour-lemon expression gets worse. The army of relatives gathered for the wedding cannot understand why Kanan is acting strange and muttering to himself, and his to-be bride is furious at his antics. There is a very unfunny scene involving a weary-eyed child domestic helper, who is traumatized by what he thinks are Kanan’s overtures towards him. If it’s not disturbing to see a child as a servant, it is certainly awful to imagine what he has gone through if he is running so scared. The backstory of the ghost has to come out, so the film jumps between the present and the sepia past, when Shashi secretly wrote poetry for a local paper and fell in love with a carousing, philandering local singer Roop (Diljit Dosanjh)—both going by the pseudonym of Phillauri, which means a resident of Phillaur, a small town in Punjab. Shashi’s affectionate but stern brother is angered by an unworthy man wooing her. This love story, far more engaging that the Kanan-Anu problems, is beautifully shot and studded with melodious songs. Anushka Sharma and Diljit Dosanjh are also better actors and much more attractive than the modern pair. 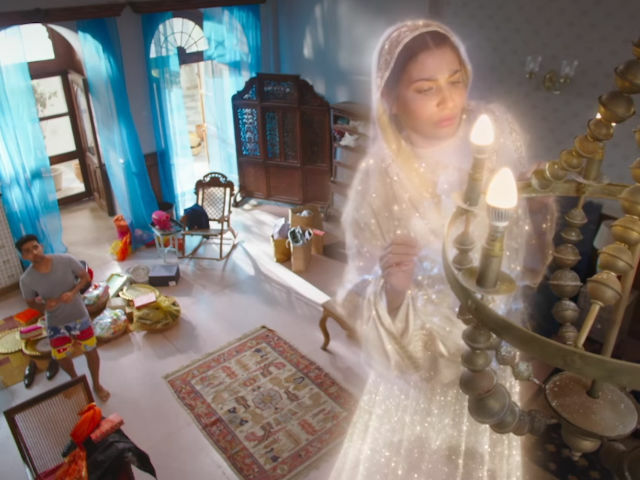 The problem with Phillauri is that it is not funny enough to classify as a comedy (too corny) and not emotional enough to touch the heart. It is watchable, but also quickly forgettable.